It was awards week in college football, and an epic showdown between Army and Navy highlighted this week’s action. The Army Black Knights got their first victory over the Midshipmen of Navy in over 15 years on Saturday by a score of 21-17. After getting out to a 14-0 lead, it seemed like Army was going to dominate. Their four turnovers kept Navy in the game. Despite losing starting quarterback Will Worth, starting running back Toneo Gulley, and wide receiver Tony Carmona, Navy clawed its way back to a 17-14 lead after quarterback replacement Zach Abey’s beastly 41-yard touchdown run gave the Midshipmen the lead with 12:42 remaining. On the ensuing possession, Army marched down the field, burning more than six minutes off the clock. The Black Knights converted two third downs and a fourth and inches in the red zone on their way to a go-ahead touchdown run by Ahmad Bradshaw (Not that Ahmad Bradshaw, this Ahmad Bradshaw). As he took a final knee to break the streak, Bradshaw turned to the cadets and watched as they poured over the barriers and celebrated with the players. It was at that moment you could see just how much this game meant to everyone involved. Despite what President-elect Donald Trump had to say on the air, this was an excellent football game. Lamar Jackson! In other news, the sky is blue and water is wet. Jackson was far and away the most electrifying college football player in the country this year, despite stumbling down the stretch against Houston and Kentucky. Jackson’s 3390 passing yards and 30 touchdowns, combined with his 1538 rushing yards and 21 touchdowns, earned him the honor, which gave the University of Louisville a first Heisman trophy. ESPN’s 30 for 30 “Catholics vs. Convicts” aired last night, and it was phenomenal. 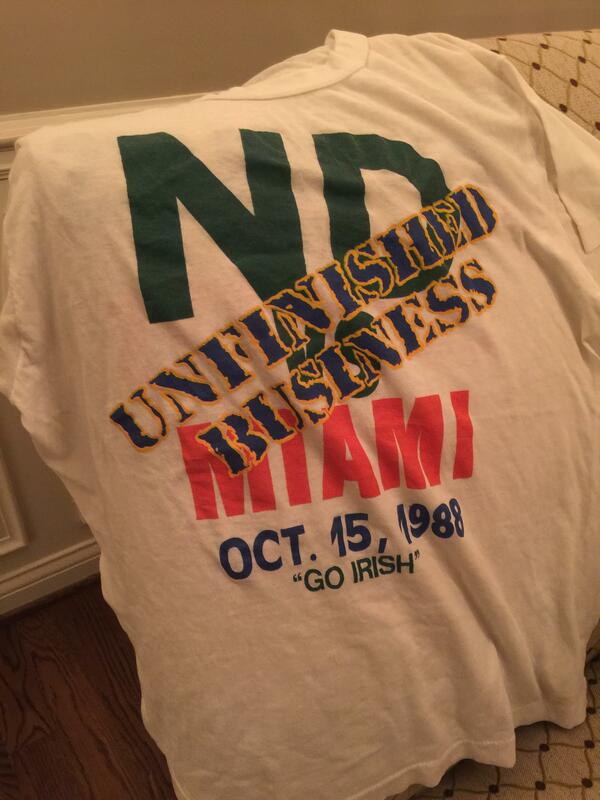 The film goes in-depth about a t-shirt business run by some Notre Dame students, which culminated in the (in)famous “Catholics vs. Convicts” shirts ahead of the showdown between 1987 defending national champion Miami Hurricanes and eventual 1988 National Champion Notre Dame. 10/10 would recommend, objectively, without any connection to either school’s fanbase. (My dad was in the stands for that game, it was his sophomore year at ND. Here’s his shirt). Contact writer John Horlander on Twitter @John_Horlander, or by email: [email protected]. December is for contenders, and the rest of the season is for pretenders. Unless, of course, you’re Ohio State, in which case you can be a contender without even playing in December. The College Football Playoff picture just got a lot clearer after a weekend chock-full of marquee matchups. Or, perhaps it’s just as murky as it was in November. Somebody call 9-1-1! I think he’s dead! But just to make sure, Derrick Gore pounded it home from 10 yards out with 3:48 to play to cap off Alabama’s 54-16 evisceration of Florida. In a game that meant little to either team’s playoff chances, Saban decided to press the pedal to the floor and try to earn Alabama a bye in the College Football Playoff, purely out of mercy to whichever sorry team gets placed at #4 (That was a joke, by the way, Alabama can’t get a bye in the playoff. The #4 team will have to play Alabama. Keep EMS on standby to resuscitate whomever it may be). Jalen Hurts had a lackluster day, throwing 11/20 for 138 yards and just one touchdown. It’s not his fault he didn’t rack up big numbers, though. There was a six-minute span in the first quarter in which the Tide gained one yard, and yet they scored 16 points. Three Alabama running backs notched touchdowns: Derrick Henry–erm, I mean Bo Scarbrough, Joshua Jacobs, and Derrick Gore. Pac-12 Champion playoff bound after all? Sko Buffs! Colorado must have forgotten that the Pac-12 Championship was Friday night and not Saturday. In another blowout conference title game, Washington made it clear that it wants its shot at the College Football playoff, as the Huskies dominated the Colorado Buffaloes 41-10. The Washington defense was stifling all night, and held the Buffaloes to 81 yards passing and 82 yards rushing. Lockdown. Jake Browning, who for some reason is still in the Heisman race, put up an abysmal 118 yards on 9/24 passing. Browning didn’t need to do much, though, because running backs Miles Gaskin and Lavon Coleman lacerated the Colorado defense for 159 and 101 yards rushing, respectively. Despite this convincing win, I still don’t think Washington will make it into the top 4 tonight. I think that the Pac-12 has spent this whole year beating up on itself, and now they’re going to be left in the dust. After trailing 28-7 with just a minute to go in the first half, the Penn State Nittany Lions rallied to defeat the Wisconsin Badgers 38-31. On the back of a 10-point fourth quarter, Penn State stonewalled Badger running back Corey Clement on fourth down to seal the victory. Clement had himself a game as well for the Badgers, chalking up 164 yards and a touchdown on the ground. Unfortunately, this win doesn’t totally seal the deal for the Nittany Lions. The committee will be forced to think long and hard about the value of a conference championship, because as it stands now, Ohio State is going to get in over Penn State, despite losing the head-to-head battle. Clemson hung on to defeat Virginia Tech 42-35. It will probably be enough to get them into the playoff, but Clemson has not been dominant this year. If it were purely up to personal preference, they can have the Orange Bowl. Western Michigan beat Toledo 29-23 in the final installment of #MACtion. The Broncos capped off an undefeated season with a hard fought 13th win in the MAC title game. They’ll be rowing the boat in the Cotton Bowl, though. No chance for playoff berth here. Baker Mayfield’s 288 yards and three touchdowns gave Oklahoma their second straight Big XII title, but it was all irrelevant bedlam. The Sooners beat Oklahoma State 38-20, but they also don’t look likely to make the playoff. Navy lost, so that makes life easy for the bowl selection committee. Email writer John at [email protected] or connect with him on Twitter: @John_Horlander. After falling short by one point against a Navy team that played the game of its life, Notre Dame rebounded with a convincing 44-6 dismantling of Army. Defending the triple option is always hard, but it’s much easier when Army doesn’t complete 4-5 fourth downs and holds the ball for half a quarter at a time. The Irish dominated from start to finish, roaring out to a 21-0 lead and finishing the game with twice as many yards and three times as many first downs as the Black Knights. It was exactly the type of commanding performance that Notre Dame needed; it proved that it won’t be going away easily to end this year. But the road is the toughest it has been so far. The Irish welcome a tough Virginia Tech squad to Notre Dame Stadium on Senior Day. Jerod Evans, the Hokies’ dangerous dual-threat quarterback, promises to make life difficult for an Irish defensive unit that, while showing great improvement since Brian Van Gorder was fired, is still young and inexperienced. They follow that up with a trip to Los Angeles to face USC in the mausoleum colosseum. USC has looked much better since it was obliterated by Alabama, and the Irish will need to be careful to avoid another beatdown like the last time they visited the Trojans. The Irish, especially freshman Julian Love, looked good against Army. Love began to stand out against Navy, finishing with eight tackles, a tackle for loss and a blow to the head that many thought would rule him out against Army. After tests showed that Love had no concussion, he stepped up again and had three tackles, an interception and a pass break up this weekend. Love, smiling like only a freshman on the sidelines after his first career interception could, symbolized to Irish critics and fans alike that Notre Dame is not done yet. A season filled with tough, close losses can often lead to uncertainty and separation in the locker room for a program like Notre Dame. There has been a great deal of debate and speculation as to whether or not Brian Kelly will retain his job next season (he will, by the way) and whether or not the players still like him (they do, by the way). At 4-6, with two tough games remaining, the Irish proved that they aren’t just looking to fast forward to next season. An absurdly talented offensive group seems to have alleviated the problems which befell it against Stanford and NC State. Equanimeous St. Brown, C.J. Sanders, Kevin Stepherson, and more headline a standout wide receiving corps. Balanced with Josh Adams, Dexter Williams, and Tarean Folston in the run game, Notre Dame has a lot of weapons with which to strike. If the defense can keep up the good work, Kelly may have just turned this season around. Kind of. Beat the Hokies. (Time to play some real football). Another great week of college football is in the books, with the exception of Georgia-South Carolina and Florida-LSU. Enjoy a recap of some of the big games and great moments. Tennessee has played five games this season. In four of them, it has trailed at some point by double-digits. Yesterday, Texas A&M became the first team to beat the Volunteers this season. However, the Aggies didn’t hold the lead, which reached 21 points in the third quarter. It even took two overtimes to put an end to Tennessee’s unbelievable streak of luck. Just like last week, it took some late magic to help Tennessee push the game into overtime. Perhaps it was less magic and more luck. Either way, it was a wild evening in College Station, TX. Texas A&M quarterback Trevor Knight, arguably one of the most electric players in the nation, put the Aggies ahead, 35-21, with 3:22 left in the game on a 62- yard touchdown run. The term generally used to describe a score like that, in that particular situation, is “nail in the coffin”. On the ensuing possession, Vols’ quarterback Josh Dobbs led Tennessee down the field and into the end zone in just a minute and 15 seconds to get within a touchdown. 15 seconds had run off the clock before Aggies’ RB Trayveon Williams delivered a play that should have warranted another cliché. This time “that’s a dagger” comes to mind. Williams sped through the defense and down the field for 72-and-a-half yards, but UT’s Malik Foreman caught him from behind and knocked the ball loose and into the end zone for a touchback. Vols’ ball, 1:49 left to play. With that kind of momentum on its side, there was no way Tennessee wasn’t going to tie the game, and it did just that on Alvin Kamara’s third touchdown of the game. What’s more, the A&M kicker missed a 38-yard game-winning field goal attempt with eight seconds left in the game. It took two overtimes before Dobbs threw an interception (Tennessee’s seventh turnover of the game) that ended Tennessee’s magical journey through the first six weeks of the season. Tennessee’s Alvin Kamara rushed for 127 yards and caught eight passes for 161 more. That was huge for Tennessee as it was missing top rusher Jalen Hurd. Dobbs threw two interceptions this week. He leads the SEC in interceptions this season. Knight rushed for over 100 yards for the second time this season. He’s currently one of the top-10 rushers in the SEC. The last SEC quarterback to finish as a top-10 rusher was Dak Prescott in 2014. Rivalry games are fun. Especially the Red River Shootout, which takes place every year in the midst of the Texas State Fair. This particular Shootout had massive implications. Whispers regarding the future of both head coaches, Charlie Strong for Texas and Bob Stoops at Oklahoma, could be heard throughout many circles during the last few weeks. The result all but guarantees Strong’s departure at the end of the season, as Oklahoma held on for a 45-40 victory at the Cotton Bowl. However, we can save the coaching discussion for another time. The story of the game was Oklahoma wide receiver Dede Westbrook. Before yesterday, Texas hadn’t given up 100 yards to a single receiver all season, despite giving up the third-most passing yards per game in the Big 12. Westbrook ended the night with 10 catches for 232 yards and three touchdowns in one of the best receiving performances in college football this season. Oklahoma’s Samaje Perine had quite a day, racking up 214 yards and two touchdowns on the ground for the Sooners. 232 yards is the third-highest total of Perine’s career and the most since the famous Kansas game in 2014. It’s not likely that Oklahoma makes the College Football Playoff, but the Sooners should still be the favorite to win the Big 12 championship. All eyes will be on the Baylor game on November 12. Jimbo Fisher has never lost to Miami as the head coach of the Florida State Seminoles. Last night may have been the closest and lowest scoring game they’ve played against each other in ten years, but thanks to DeMarcus Walker’s blocked extra point with 1:38 left, the Seminoles notched their seventh win in a row over their in-state rival, 20-19. Deondre Francois looked terrific. The true freshman passed for 234 yards and two touchdowns. Francois has been solid all season, passing for nine touchdowns and only two interceptions so far. Heisman hopeful Dalvin Cook moved his consecutive 100-yard game streak to three. Cook rushed for 150 yards but no touchdowns. There are only three weeks until Florida State hosts Clemson. Florida State is really the only tough matchup left on Clemson’s schedule before the ACC Championship game. -Houston will not make the Playoff after losing to Navy 46-40. I’d also be surprised if it beats Louisville. -Stanford is not a top-25 team. -As a former offensive lineman, this play makes me happy. Watch how fast that guy is. -Ohio State is the best team in the country. -Washington is really, really good. -In case you missed it, Rutgers only amassed 39 total yards of offense against Michigan. Every now and then some random person on the Internet asks me which teams I cheer for, which teams did I grow up watching and which teams I hate. Since we’re so close to the beginning of the season, I think this is a good time to pull back the curtain and tell you about the teams I’ll be cheering for this season. Note: I’m still not going to tell you my teams. Everyone has secrets. This IS actually a team I grew up cheering for. I went to the 1993 Sugar Bowl where my guy Gene Stallings led the mighty Crimson Tide to a National Championship after defeating the hapless Miami Hurricanes. Keith Jackson, Bob Griese, Bourbon Street and tons of women. I don’t remember any of it, but I’m told it was all there. Anyway, I expect the 2016 version of the Tide led by Nick Saban to, well, win another title. I am a Bama guy and Saban basically wins it every other year. There will be struggles – the obvious being: Who is the quarterback? Will the defense survive the season without a major injury? How many games will the Tide lose this season? The last is the most important of those questions, so let’s get to it. Alabama will lose a game this season and it will mean something in the long run. Most likely, the loss comes to, yes, LSU and Les Miles on Saturday, November 5, in beautiful Baton Rouge. I only give the Tigers a chance at this because I’m not stupid enough to pick against LSU at home, at night. That’s it. If this somehow turned into a 3:30 start (the time hasn’t been announced yet), I’d take Alabama without thinking twice. Again, this IS actually a team I grew up cheering for. I love Navy, how can you not? The Silent Service, the SEALs, the jets and yeah, Top Gun. Exactly. Navy will not win the American Athletic Conference, the Middies will not beat Houston (I won’t be mad if they do) and they will not make the AAC championship game. Here’s what Navy will do: Beat Air Force, Beat Army and make Notre Dame shake in their shorts a little bit. None of those three predictions is surprising. I expect a down year for Navy after the graduation of Keenan Reynolds and transition to Tago Smith (probably). As a result, I expect the overall offensive production numbers to be low. If you’re available on October 8 and can get to Annapolis, then watching Houston play Navy is worth your trip. I have a team in the Pac-12 I like, but it isn’t UCLA. I’ve also made it clear I think USC is overrated in every imaginable way. I don’t care if my Pac-12 team and USC make me look stupid this year, but if they do, I’m still on the Josh Rosen train. I read Matt Hayes’ profile of Rosen [link http://thelab.bleacherreport.com/a-beautiful-brash-mind/] and it’s worth every moment of your time. Rosen, much like me, comes across as a straight-shooter. He’s a, “It is what it is and they are who we thought they were,” kinda guy. Rosen knows he’s good and doesn’t give a damn. He says what he wants even if it might hurt him at the next level, but he’s there for his teammates and in the end that’s all that counts. I’m sure there are other Josh Rosen’s in college football this season, but he has my attention right now and that’s all that counts. Can Rosen and UCLA head coach Jim Mora lead the Bruins to the Pac-12 Championship, sure. I don’t think they will. I think Stanford has the best chance. UCLA’s losses this season: vs. Stanford, vs. Utah, and at Colorado (only because it’s a Thursday night). Remember: USC will not be as good at the end of the season as people think they are now. I have zero connection to the Tigers except for my friend who’s a Tigers fan, so I’ll take it. I also think the Tigers make the playoff this year, but I’m not sure they’ll make it past the semi-final. If Clemson makes it past Auburn this weekend (spoiler alert: they will) then the [Clemson] Tigers should run the table. That includes beating Florida State in Tallahassee and whatever lower-level team Dabo Swinney and company face in the ACC Championship. Deshaun Watson, Dabo Swinney, and a workable schedule put the Tigers back in the playoff two years in a row. That’s it. This pick is based purely on how many good starters Clemson is returning and a friendship. Go Tigers…or whatever they say in South Carolina. Michigan State – I like Mark Dantonio a lot and I like Tom Izzo a lot. I think the Spartans have a lot of work to do in a reloading year, but I think having Michigan and Ohio State at Spartan Stadium works in their favor. The primary goal this year should be to defeat Ohio State since the Buckeyes will beat Michigan in Columbus this year. Create Big Ten chaos, Mark. It’s been forever. Arkansas – This is sort of a shot in the dark. I like Bret Bielema and I sort of feel like he’s the kid at school that will do whatever it takes to get just a tiny bit of attention. I think that’s why he embraces ‘Bert’ and says stupid things like his kids will never get in trouble. The Razorbacks might also be the only team in the SEC – and maybe the country – that faces five ranked teams with four at home. It won’t matter, Arkansas will get slaughtered by Alabama and Ole Miss. And ya know what, there’s a chance they face a sixth (SIXTH!!) ranked teams this season. Look, I know a lot of people think Bielema is in over his head at Arkansas, but as I said earlier this week, it won’t matter who else is coaching in the SEC West as long as Nick Saban is there. That’s it. Those are the six teams I’ll be cheering for this season. E-mail me at [email protected], follow me on Twitter @damienbowman or if you think you’re good enough, join the staff. These are the dog days. The weather is overbearing in a way that makes us simply want to wave the white flag. As the calendar flipped to August, I was reminded of one of my favorite football movies, “The Best of Times,” starring the late Robin Williams. You should put this on your list if only for the poetic diatribes and quotable lines. When describing the anticipation of the annual rebirth of football, Williams encapsulates the anticipation, the hope of a new season. The hope he speaks of is found in an ideal unique to college football. Tradition. A three-syllable word that defines the phenomena that is the sport we love. It’s more than just what happens between the lines. Coaches and players come and go, and the sport encompasses more than Xs and Os. It’s the Vol Navy sterngating in the shadows of Rocky Top. It’s the Sea of Red releasing balloons when their Huskers score for the first time. It’s Army and Navy desperately trying to “sing second.” It’s doing the Hokey Pokey at halftime in Blacksburg. It’s dotting the ‘i’, screaming “Bear Down,” “Boiler Up,” and striking the Heisman pose. It’s the sight of beloved mascots like Ralphie, Tusk, Cam the Ram and Mike the Tiger. It’s the smells filling the State Fair on Oklahoma-Texas weekend, permeating from Dreamland on Friday afternoon, and wafting across The Grove on Saturday morning. It’s the deafening cheers in The Swamp, The Horseshoe, The Doak, “between the hedges” and down on The Farm. It’s the driving melodies of Texas Fight, Fight Tiger, Tiger Rag and Ragtime Cowboy Joe. The autumn spectacle makes this sport special. It has survived world wars, financial recessions, and national tragedies. The passion and traditions are cultural – inherited at a young age, carried through tenure as a co-ed, embraced as a seasoned alum, and then taught to the next generation. The Sooner Schooner serves as the live mascot for the University of Oklahoma and it rumbles across the field after Sooner scores. Photo taken from a message board and used by permission by the unnamed photographer.